There are many green tea fat burning and health benefits. People have been drinking green tea (Camellia Sinensi) for thousands of years, and you can use it to help yourself lose weight. Check out the list of health benefits below, as well as information about how much green tea to take. It's not a silver bullet, but it can be very helpful. Why Drink Tea? And Why Green Tea? Tea has tons of therapeutic properties when taken for the right reasons. In Japan and China tea has been drunk for centuries for medicinal purposes, and just as a beverage. And, more importantly, modern science has shown that it actually is effective for burning fat. Cool Fact: Bruce Lee loved drinking tea. He liked all kinds of Chinese teas, especially strong black milk tea with sugar (奶茶), and friends gave him gifts of many kinds of tea. All teas contain caffeine, which helps speed up your metabolism to burn fat. But green tea does so much more. In fact, the American Journal of Clinical Nutrition has stated that, "green tea extract has thermogenic properties and promotes fat oxidation beyond that explained by its caffeine content." 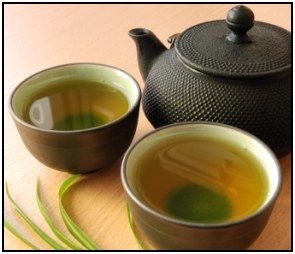 Green tea is also unique because it contains the polyphenol component epigallocatechin gallate (EGCG), which other teas do not. Black and oolong teas are fermented as part of their preparation, and the fermentation process fails to preserve the EGCG. EGCG blocks the action of an enzyme that breaks down the hormone Noradrenaline (NA, sometimes referred to as norepinephrine). So, when you drink green tea or take a green tea extract with EGCG, more NA stays in your bloodstream helping you burn calories and not convert them into fat. Here are some more reasons that, from a scientific standpoint, green tea benefits weight loss. There are tons of them, but here are just 4 to start with! Green tea assists insulin in removing sugar spikes from your bloodstream. Green tea helps inhibit the action of the enzyme lipase in your body. Lipase helps convert fat in foods that you've eaten into fat that can be absorbed. Thus, you just excrete the fat your body can't absorb - keeping you skinnier. Green tea significantly increases thermogenesis, or the burning of calories to create body heat. In fact, the increase in thermogenesis is beyond what you would expect from looking at green tea's caffeine content alone. Green tea benefits weight loss since it contains caffeine, which increases the rate at which fat gets burned. Take 200-300 mg, and take it 30-45 minutes before exercise - if you're exercising that day. Another source says 270 mg is the optimal dosage for green tea fat burning, but that 200-300 mg range will serve you well. If you're taking tea explicitly for fat loss, consider buying some green tea extract powered or pills. You get about 40 mg of caffeine and active green tea in 1 cup, so unless you're drinking tons of tea throughout the day (5-7 cups minimum) you'll want the extract. Caffeine boosts your metabolism and helps make green tea fat burning happen. However, if it's late at night and you don't want to stay up, or for whatever reason you don't/can't take caffeine, here's an easy tip for brewing decaffeinated tea to still get some weight loss benefits. Most of the caffeine in tea is released in the first 1 - 2 minutes of steeping. If you want decaffeinated tea, simply steep your leaves for 1 - 2 minutes and throw out the water. Then add new water to brew your decaffeinated tea. Green tea fat burning is not magic. It's a great supplement, but if you just start drinking tea you won't lose weight. Do exercise, start weight training, and eat a good diet. Those are the fundamental steps to take before you try green tea fat burning. • Click here to leave 'Green Tea Fat Burning: Get The Info You Need' & go back to the Home-page! 1. Lee, Bruce, and John R. Little. 1998. The Art of Expressing the Human Body. Boston: C.E. Tuttle Co. Pp. 170. 2. Shilstone, Mackie. 2005. The Fat-Burning Bible: 28 Days of Foods, Supplements, and Workouts That Help You Lose Weight. Hoboken, N.J.: John Wiley & Sons. Pp. 161. 3. Preuss, Harry G., and Bill Gottlieb. 2007. The Natural Fat-Loss Pharmacy: Drug-Free Remedies to Help You Safely Lose Weight, Shed Fat, Firm Up, And Feel Great. New York: Broadway Books. Pp. 23. 6. Dulloo AG, J Seydoux, L Girardier, P Chantre, and J Vandermander. 2000. "Green Tea and Thermogenesis: Interactions Between Catechin-Polyphenols, Caffeine and Sympathetic Activity". International Journal of Obesity. 24 (2). 7. Weinberg, Bennett Alan, and Bonnie K. Bealer. 2001. The World of Caffeine: The Science and Culture of the World's Most Popular Drug. New York: Routledge. Pp. 286. 10. Prout, Linda. 2000. Live in the Balance: The Ground-Breaking East-West Nutrition Program. New York: Marlowe & Co. Pp. 275.